Well the best was saved for last. 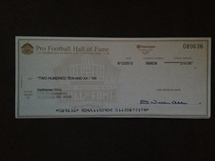 D received her check for her efforts at HOF inductee ceremony August 3rd. Job well done!